Providing you the best range of supermarket end racks with effective & timely delivery. 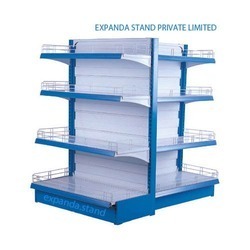 End Racks are also termed as ‘End units’, ‘G type Racks’, ’Merchandise unit’. The End racks are normally located at the end of the gondola run which helps the customers to identify the category/segment of goods displayed in the gondola/centre racks.